Photos provided by Ron Adams, Debbie Sargent, Sandy Castle, Ted Lewczyk and others - thank you! 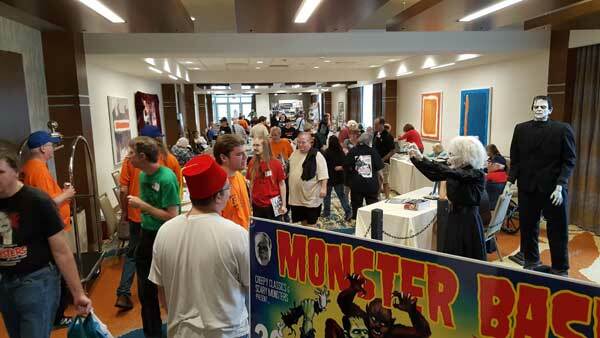 Here's a group of charcters from Saturday at this past MONSTER BASH. 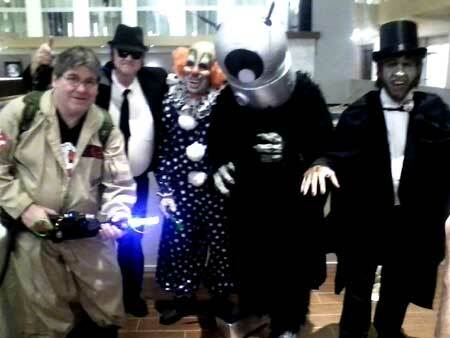 Ghost Buster Mike Cregar, Jake Blues was Richard Sands, The Creepy Clown is Dan Zanol, Robot Monster is Jon Doerr and Mr. Hyde is Charlie Arrigo in make-up by Ron Chamberlain! A motley crew of Monster Bashers! 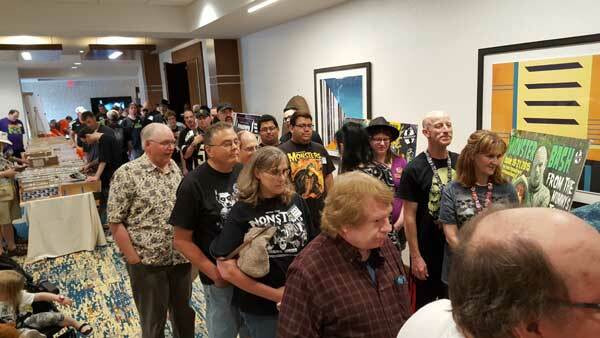 The line that kept going and going for free cake Saturday night at this year's MONSTER BASH! Giant monster sheet cakes were sliced and given ti hundreds and hundreds of fans. 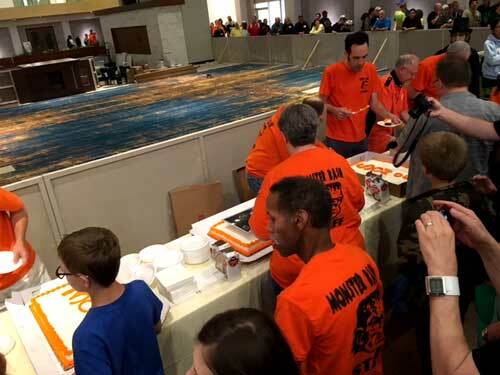 The staff cutting cake as fast as they can Saturday night...somewhere in there working on the cake, in orange, it's staffers Barb Heiss, Ron Adams, Thom Shubilla, Bob Kennedy, Joe Hagan, Ursula Adams and others. Hanging with Hyde in the lobby....it's the Sargent sisters. Charles Arrigo as Mr. Hyde (make-up by Monster Bash Make-Up Master, Ron Chamberlain). A terror trio at Monster Bash. 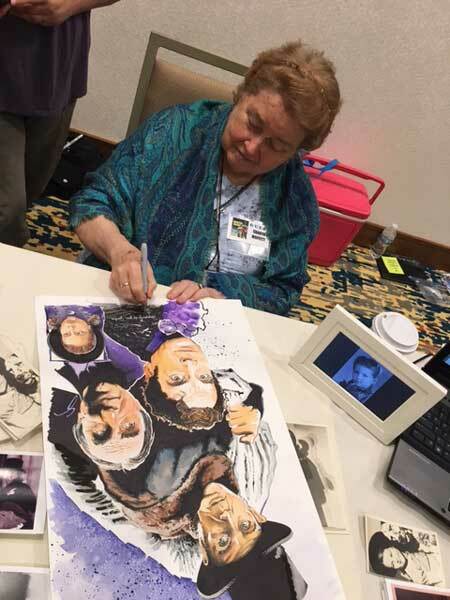 Actress from THE BODY SNATCHER (1945), Sharyn Moffett signs artwork on the movie by John Sargent! 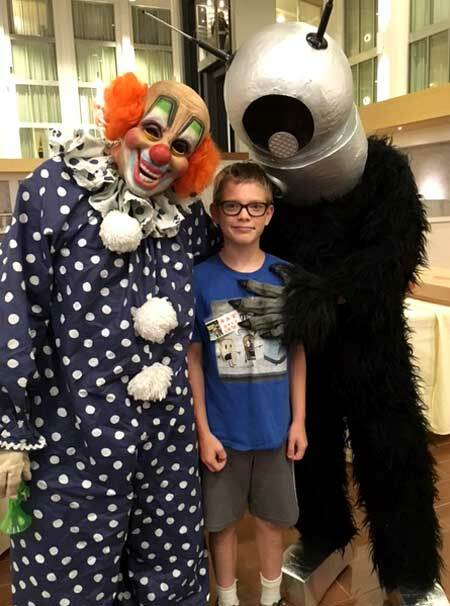 Roaming the upstairs halls, you never know what may be around the next corner! 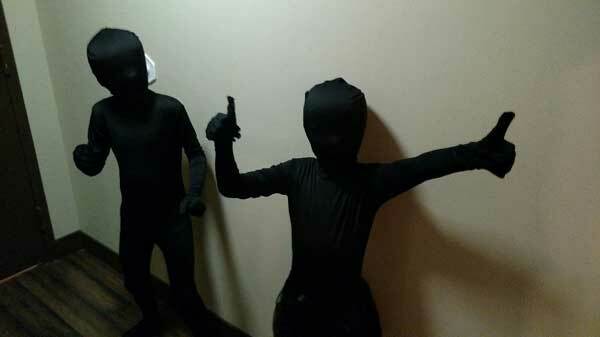 A shadow person that we found to be Korbin Wieland vexed our reality! 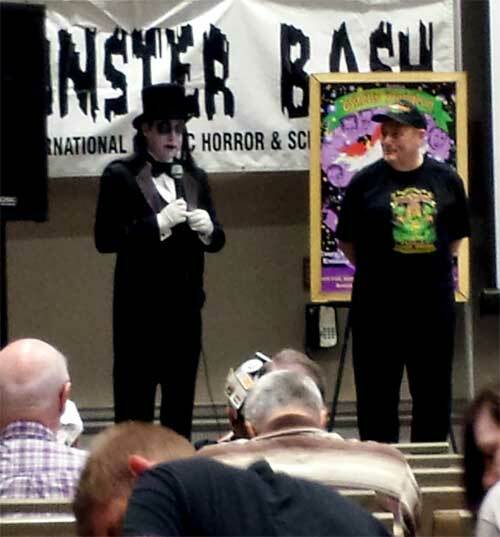 The mad hypnotist and mind-reader from The Monster Bash Late Night Spook Show! Never trust anyone with a pencil-thin mustache! Even if he goes by the name Thom Shubilla on the streets of Eastern Pennsylvania. 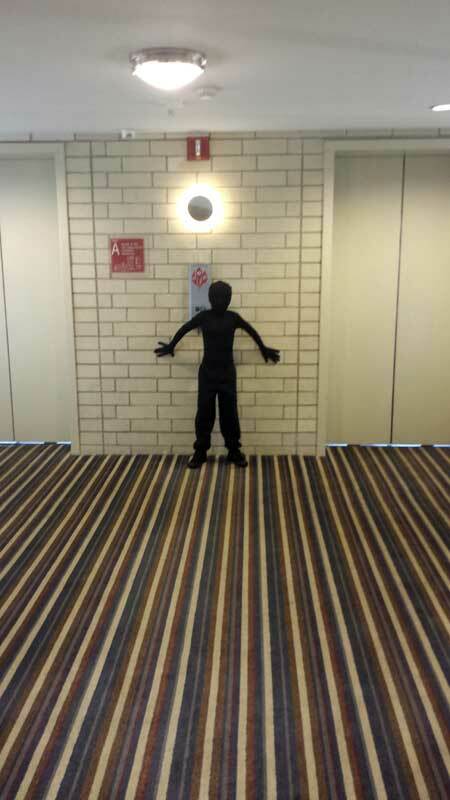 Turns out the hotel had an infestatiion problem....ghosts. 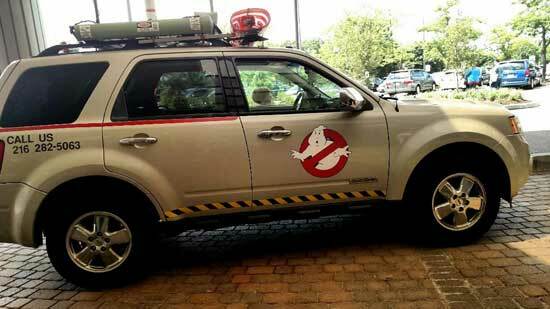 Luckily the team was there to contain the problem. 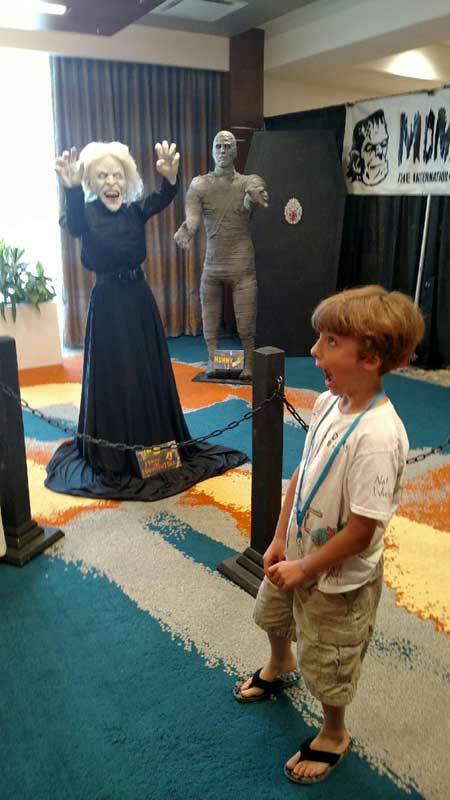 Mummies and Witches (fresh from HOUSE ON HAUNTED HILL) were there to provide shivers and screams! More Shadowland creatures in the halls (Korbin and Gaby)! 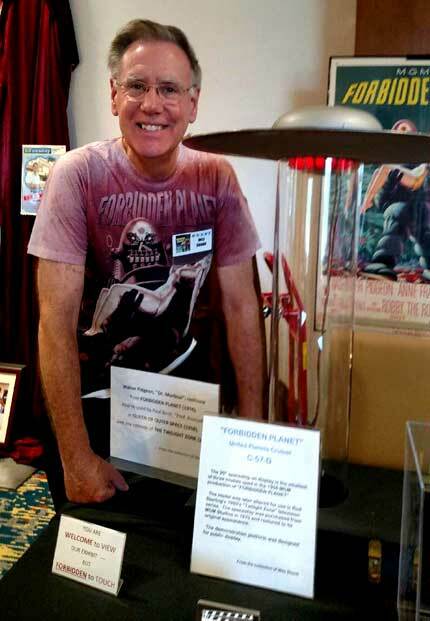 Jdi and Wes Shank display original props from FORBIDDEN PLANET (1956). 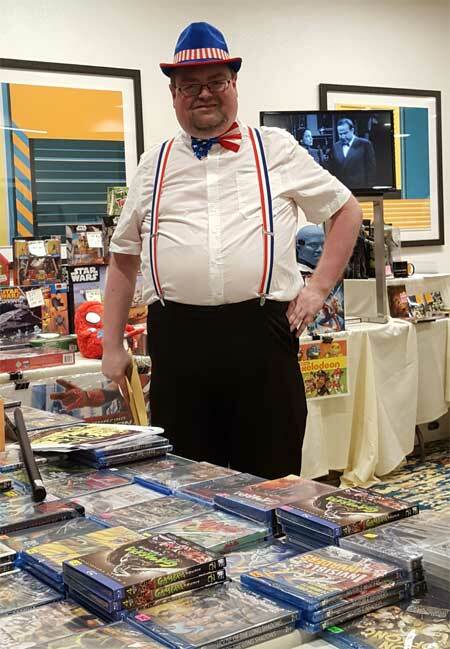 Wes with a FORBIDDEN PLANET original saucer prop and other space age items from the past at Bash! 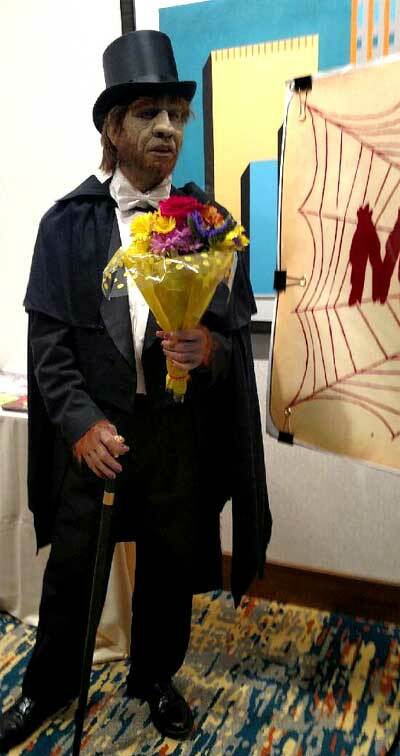 Would you accept flowers from this guy? You'd be better off playing Hyde-and-Seek....without the seek. 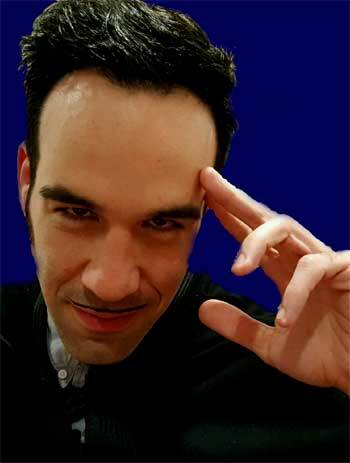 Charles Arrigo in make-up by Monster Bash Make-Up Master Ron Chamberlain! A Motley Crew Bashes on Saturday night! Cortlandt Hull (right) and Farnsworth, the tour guide for The Witch's Dungeon discuss the 50th anniversary of this amazing attraction. 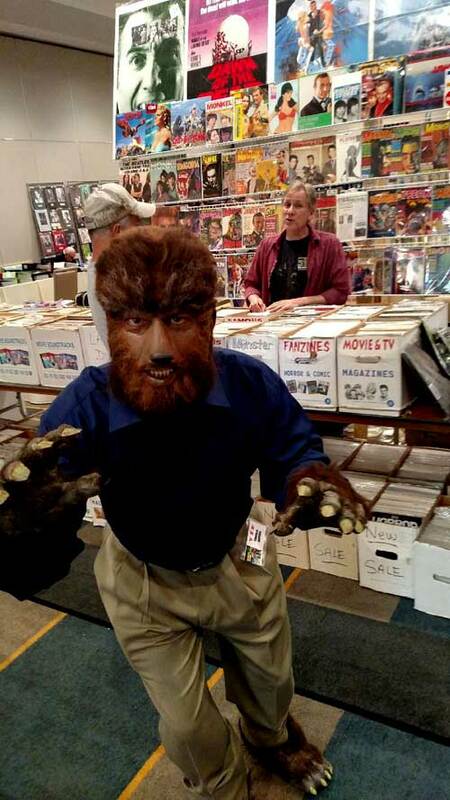 A Wolf Man Among Us at Monsters Among Us! 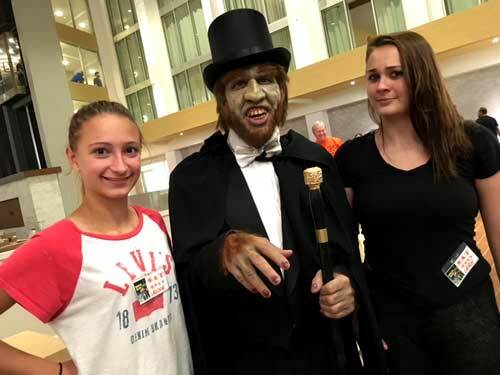 Michael Pierce in the background, Charles Arrigo as The Wolf Man in make-up from Monster Bash Make-Up Master Ron Chamberlain! 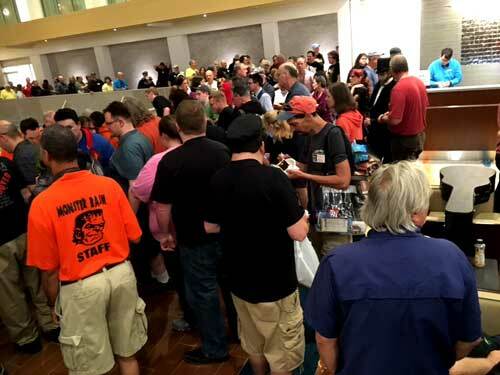 Saturday morning, folks head for the Guest of Honor for autographs. Guests of Honor are down the hall....somewhere. Uh-oh! It's like "Finding Waldo." Can you spot writer and film historian Tom Weaver? Leonard Hayhurst, the best Spook Show barker in Bashland! 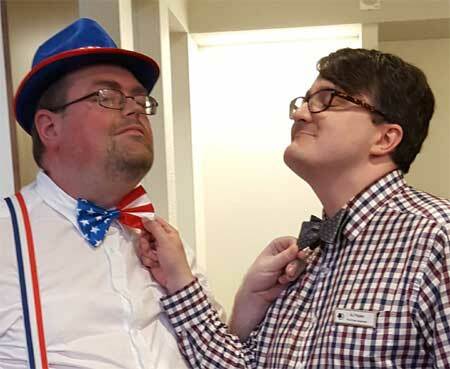 Bow-ties are back! 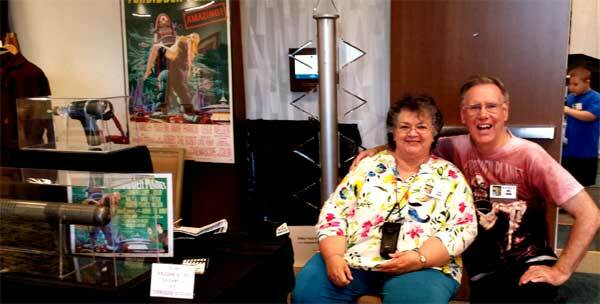 Monster Bash's Leonard Hayhurst with Double Tree staffer A.J. 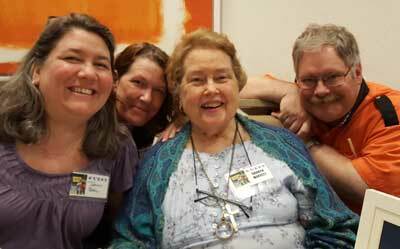 Sharyn Moffett (actress from THE BOSY SNATCHER with Boris Karloff), along with Monster Bash's Ted Lewczyk and her daughters (on left). 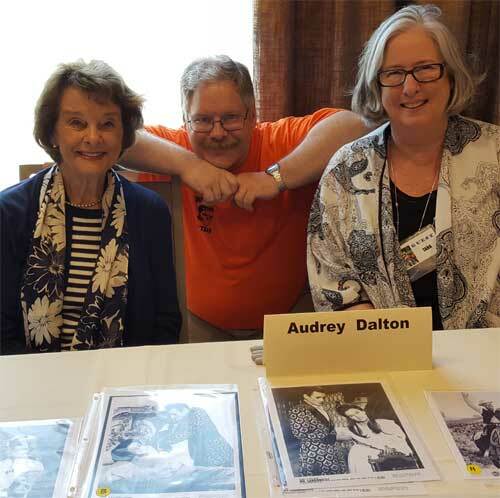 Actress Audrey Dalton (MONSTER THAT CHALLENGED THE WORLD, MR. SARDONICUS, THRILLER) with Ted Lewczyk and Audrey's daughter, Tara.